Walter Rauschenbusch is credited by many interpreters as the fountainhead of the social gospel in America. An American Baptist minister of German heritage, Rauschenbusch was the “prophet” of a movement that created a watershed in American religious thought. A theological educator, social activist, and church historian, Rauschenbusch is continually revisited a century after his death. This three-volume set makes available the original texts of a seminal thinker in an authorized and critical edition. 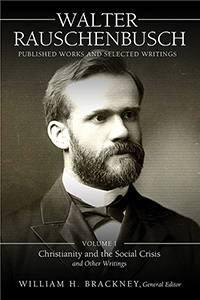 Volume I contains reproductions of the original texts of the first “great book” of Walter Rauschenbusch, CHRISTIANITY AND THE SOCIAL CRISIS (1907), plus another popular work, FOR GOD AND THE PEOPLE: PRAYERS FOR THE SOCIAL AWAKENING (1910). Historical theologian William H. Brackney, who was curator of the Rauschenbusch Papers in the American Baptist Historical Society at a time when much new material was being added to the collection, provides an historical introduction to Rauschenbusch’s life, taking into account a wide variety of primary and secondary sources, plus recent interpretations of Rauschenbusch’s work. Also included are shorter works, THE NEW EVANGELISM, Samuel Zane Batten’s defining tract, THE KINGDOM OF GOD, Rauschenbusch’s last literary works, select Rauschenbusch correspondence, and a hymn written in his honor.